Nick Sopko scores for the Hurricanes in the seventh inning. *Photo courtesy of Gainesville High School Baseball. 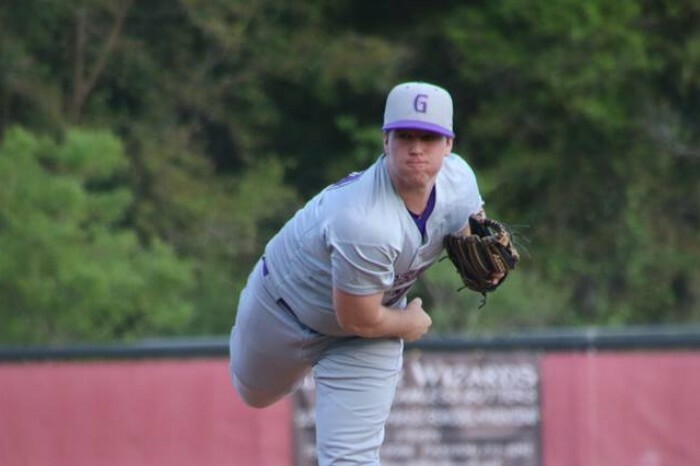 The Gainesville Hurricanes rallied to a big road victory to tighten the race in the 7A District 13 standings on Thursday night, with a 5-4 comeback victory over the host Middleburg Broncos. 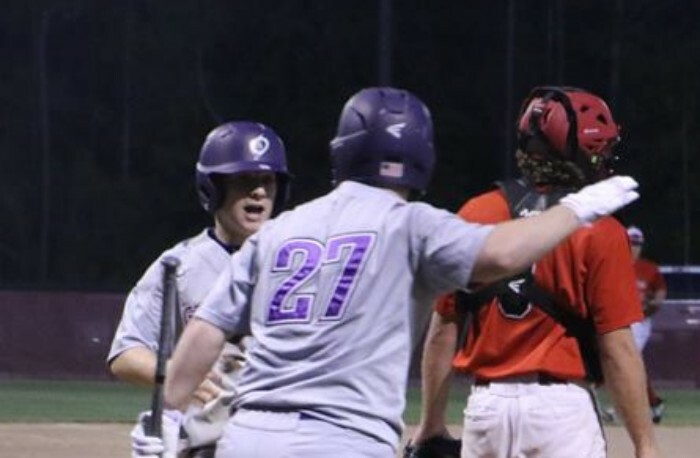 Thanks to three runs in the top of the seventh inning, Gainesville pulled into a three-way tie with the Broncos and Columbia for the top position in the district. All three teams currently sit at 2-1 in 7A-3, in a district chase that figures to be as tight as always again this season. The Broncos (8-2) had won four straight heading into Thursday’s action, and they got off to a hot start early on to erase a 1-0 deficit and take the lead in the bottom of the second. 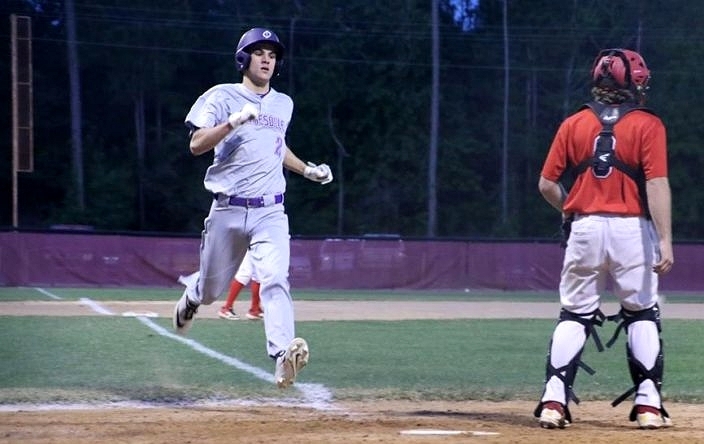 After Gainesville’s David Rowe scored off an error in top of the second, Broncos junior Cameron Faucett clubbed a three-run home run to give his team a 3-1 lead. Hunter Conaway and Joe Justino both also scored, after each singled to put some ducks on the pond. Gainesville’s Luke Marquis earned the win with six strong innings, allowing three earned runs with seven strikeouts. *Photo courtesy of Gainesville High School Baseball. Gainesville starter Luke Marquis settled in after allowing Faucett’s home run, as he went six strong innings to keep his team in the contest. The right-hander scattered seven hits and three walks, and struck out seven to earn the victory. The Hurricanes (4-8) answered back with a run in the third. Zeb Marquis singled with one out and then came home thanks to an RBI double from Marcos Aular, who was 3-for-4 with two doubles and two RBIs to lead all batters. Middleburg added on to its lead as Collin Henderson manufactured a run in the sixth. Henderson worked a one-out walk, stole second, advanced to third on a wild pitch and then scored on a passed ball to give the Broncos a 4-2 advantage. The Hurricanes celebrate during their seventh-inning rally. *Photo courtesy of Gainesville High School Baseball. Down to their final three outs, the Broncos answered back to steal the victory. Nick Sopko singled to left and then quickly raced around the bases to score thanks to a triple deep to center off the bat of Seth Cox. Zeb Marquis followed with an RBI single to right that tied the game, and Aular delivered the winning runs with a double to right. Middleburg did not go down quietly. Clayton Simmons greeted Aular on the mound to close things out by sending a 2-2 offering to left for a lead-off double. Colby Anderson then collected his third hit on a 3-for-4 performance to put the go-ahead runner on base. But Aular induced an unlikely 5-3 double play, and followed that with a grounder right back to the mound for the easy putout that ended the battle. The two rivals are back in action again on Friday, with Middleburg serving as the host this time.